Tajima Beef Full Course Plan one night lodging and two meals included. ＜Tajima Beef Full Course Plan＞ A full course plan that allows you to enjoy Tajima beef, the origin of Kobe beef, Matsuzaka beef and Omi beef as steak, hot pot, nigiri sushi, and other creative styles. 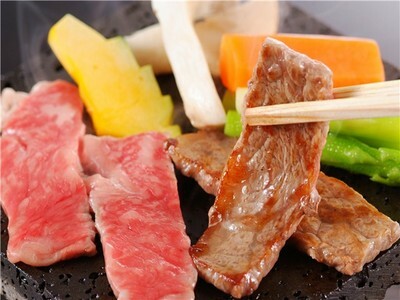 In order to get the maximum original flavor out of the deliciously marbled Tajima beef, we will grill it on a natural hot lava plate in front of you. We are one of the ryokans in Kinosaki which serve various local sakes (Japanese liquor), and local beers. We will prepare a real Japanese breakfast of white rice, grilled fish, miso soup, Japanese style omelette, soybean milk hot pot, steamed egg custard, salad and so on. Seasonal Kaiseki Cuisine Plan with one night lodging and two meals included. 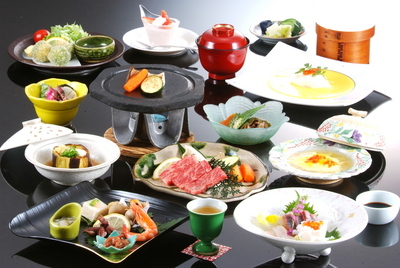 ＜Seasonal Kaiseki Cuisine Plan＞ We will prepare for you our original seasonal Kaiseki cuisine. This includes dishes such as sashimi, made from fresh fish from the Japan sea, steak made from Tajima beef, which is the origin of Kobe beef and Matsuzaka beef, plus individual hot pot and tempura made from ingredients grown in the Tajima area. We are one of the ryokans in Kinosaki which serve various local sakes (Japanese liquor), and local beers. We will prepare a real Japanese breakfast of white rice, grilled fish, miso soup, Japanese style omelette, soybean milk hot pot, steamed egg custard, salad and so on.